After playing the demo of SEGA's gorgeous Valkyria Chronicals, I thought no better time than now to jump in the Delorian and take a spin back in time when I was the proud owner of an Atari 5200! 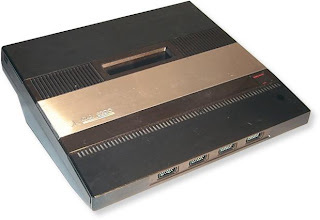 The year, was 1983 and the first console war had begun between Coleco Vision and Atati's 5200 system. I wish I remembered how much games cost back then, it's depressing to think someone in my family paid close to the same amount for this game as a PS3 game. It's been 26 years since I've played Congo Bongo but I do remember Donkey Kong was all the rage then and when I saw this I figured it was gonna be as fun....I was wrong. The 3Dish game screen was an aspect that probably had me going gimme gimme. I do remember the controls being infuriatingly difficult, as seen in the below video the first level "Primate Peak" had a jump that 99/100 times you'd die trying, and avoiding the various critters was an exercise in futility. The games box art says it was the "official arcade version" and it was certainly visually better than the 2600 but it wasn't close to the arcade version graphically. The audio was as good as the 5200's POKEY chip could do, with it's 4 audio channels you weren't going to get an exact arcade port, I was 10 years old and didn't know better, so no harm, no foul. I remember spending long stretches of time trying to reach that damn ape, so I suppose it kept my attention. Out of the five or six games I had for the 5200 Congo Bongo has the best graphics, it only had two of the four levels that the arcade had but that was still twice as many as most games of that time. The game play was frustrating but that built a determination in me that lasted till today to want to beat a game I have and not stand defeated by cheap or over difficult AI, and lastly the box art was a huge step up from most of the stuff of the time. 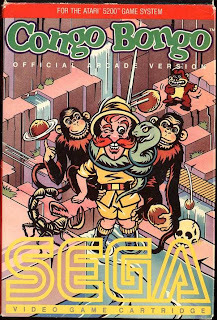 If you want to experience this obscure classic, Congo Bongo is an unlockable game in PSP's SEGA Genesis Collection.